Bergen Refrigeration provides sales and service report to keep your facility producing the ice needed. As part of our commitment to offer only the best, we sell only the most reputable machines. We sell Hoshizaki, Manitowoc, and Scotsman makers. Not only do we sell new equipment, but Bergen Refrigeration also services and maintains existing equipment in facilities throughout northern New Jersey. When your ice maker is not working as expected, give a call and we’ll schedule a technician to arrive on site as soon as possible. We recommend all ice machines to be cleaned/sanitized at least 2 times per year. Bergen Refrigeration supplies this service as part of our Refrigeration Maintenance program. 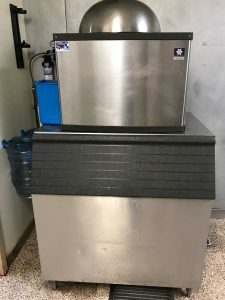 Our commercial ice machine representatives are happy to answer any questions you have and are there to help you find the best solution for your needs. For additional information or to speak to someone directly please call us at (973) 779-9977or email us.